How to: Whiz the butter and sugar together in a processor for a minute, then add the eggs, one by one, along with the flour, salt, baking powder and lemon juice. If preferred, beat the butter and sugar together with a wooden spoon, then incorporate the other ingredients and continue beating until a smooth batter is obtained. 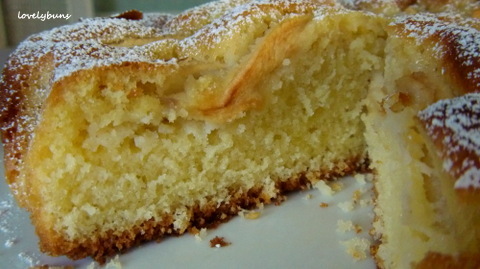 Line a tart or cake tin with greaseproof paper and pour/spoon the batter in. Peel and core the apples and cut into thin wedges. Position the wedges in the batter , pushing them in so that just the thick edge of each apple slice is left visible. Continue until the batter is completely covered with apple slices. Bake at 180°C for 35 mins. The cake is ready when golden and a skewer inserted into the cake comes out clean. 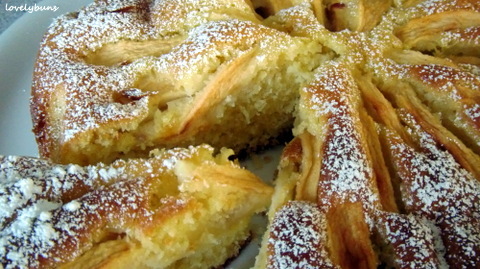 Leave to cool, then turn out onto a cooling rack before putting on a plate and sifting icing sugar over the top. It could also be served with a spoonful of cream or crème fraîche for dessert. Oh my gosh, excuse me while I pick up my jaw off the floor! This looks amazing! Hey thanks, it tastes great too! This really looks delicious. thanks. This cake. Looks SO incredible!! Definitely one of the yummiest looking apple cakes I’ve ever seen!! Your baking is absolutely gorgeous. Beautiful pics. I really enjoyed spending time on your blog. Thanks, you are very nice 🙂 Now Christmas is over I need to get back to reading your blog and updating my own…. 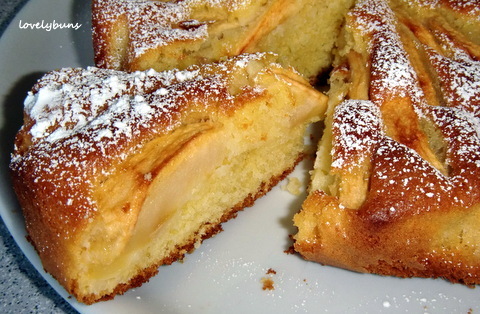 I love apple cake and yours look and sounds very good! Thanks, apple cakes are always good! 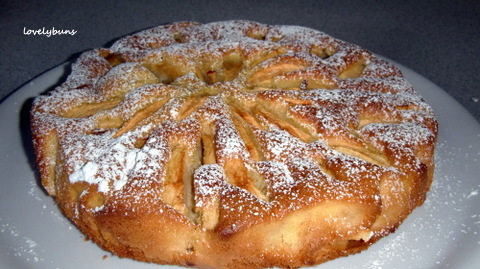 I made your apple cake for Stefano. Wow!!! You really made him happy. The taste is simply magnificent. Perfection at its best. Hi, did you use bramely apples? This cake looks so good! My grandfather, who I never knew, was Alsatian, but I don’t remember my mother ever making a cake like this. Can’t wait to try it!